I remember as a kid on cold, snowy days my mom use to totally have a plan. Campbell’s Condensed Tomato Soup and grilled cheese sandwiches. If I close my eyes. I see it vividly in my memory. Walking home in a snow drift on a WAY TOO LONG ahem windy road after the bus dropped us off after school. If I remember correctly there is a vintage commercial with a kid walking home in the snow and into their moms kitchen for soup and sandwiches, right? Ok. Back to my magical memory. When I close my eyes, I can remember the cold air. I remember my mean sister throwing snowballs at me the entire walk home. And by the time I finally reached our house I could barely feel my lips. My mom would already be home from work for the day & I can still smell the hot soup and freshly sizzled grilled cheese. She use to put so much cheese on that sandwich that it was beyond gooey when we’d cut it in the angle to dip in our soup. And yes, oh wise one. There are so many more ways to dunk than you thunk. Can I share the ways? Goldfish crackers. DUNK. Bagel bites. DUNK. Croutons. DUNK. Pretzels. DUNK. Grilled Cheese sandwiches of course. DUNK. Hot ham and cheese? SLAM DUNK. Two things have come out of this entire stream of consciousness. One is...I really miss my childhood. Even my mean - snowball throwing sister. Two....I know what’s for dinner. Maybe I’ll wear my hair in pig tails or a french braid during dinner and allow myself and kids to slurp the soup and string the cheese sandwiches. 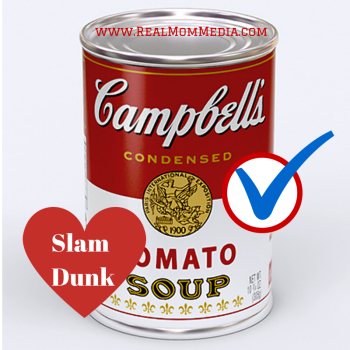 What do you like to dunk in your soup? Or...be brave and as The Wisest Kid in the Whole World! He knows a LOT. DISCLOSURE: This is a sponsored post as I am an ambassador for Campbell's Soup Company. But yes. I DO love them and the memories their soups gave me as a kid! Dunk Em Peeps.